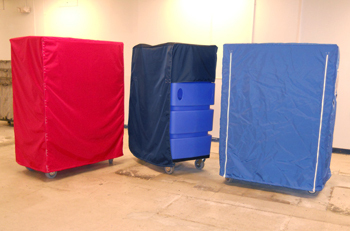 Did you know Latest Products Corp. is one of the nation’s largest suppliers of cart covers and shelving covers? All of our covers are custom designed to your specifications. We use reinforced corners on all covers to withstand wear and tear, and use either reinforced Velcro or heavy duty zippers to provide a more secure closure for the front flap. Many fabric choices and colors to choose from, depending on your application. For sizes not shown or special requirements, please contact us here or call 800-288-3547 so that we may prepare a quotation for you.